It’s the end of another working week, but this is an important day for me for deeper reasons than that. A year ago today – Thursday 6th December 2013 – I was in Papworth Hospital in Cambridgeshire having a CRT pacemaker fitted. This was to cure an arrhythmia that I had been left with by hypertrophic cardiomyopathy, a disease where the myocardium is enlarged, without any obvious cause, weakening the left ventricle and impeding the heart’s ability to pump blood effectively. It’s a disease that kills people. It killed professional footballers Marc-Vivien Foe and Miki Feher while they were on the pitch. It killed a young player named Mitchell Cole, brother-in-law of Joe Cole (their shared surname was a coincidence). It nearly killed Fabrice Muamba while playing for Bolton against Spurs. The list of US sportspeople it’s killed is long and, frankly, pretty scary. It killed the peerless Leonard Rossiter just before he went onstage in London in 1984. It’s pitiless in its ability to kill suddenly, with no warning and no prior symptoms. I was very, very lucky, because I did present symptoms. They were mis-diagnosed at first. The primary symptom was a very painful, distended abdomen, along with fatigue and shortness of breath. The swollen belly was diagnosed by a locum at my GP’s practice as acid reflux for a while, until 23rd December 2011 – my 30th birthday. I’d called the doctor in a panic and begged for an appointment, as this was very close to Christmas and my legs had now swollen up too. I hadn’t slept properly in a few weeks, was now at a stage where I couldn’t sleep at all (because I couldn’t lie on my back without coughing, and in any other position my stomach was too painful to allow me to sleep) and was terrified of being stuck in this condition until after Christmas. When she saw me stagger in, breathless, I saw her reaction, and I’m pretty sure we both knew I was in trouble. I was advised to go to hospital straight away, where I was admitted and where I stayed for 12 days while my condition was stabilised with medication, the fluid I had retained drained from me with loop diuretics (I came out of hospital about 20 pounds lighter than I went in – no exaggeration) and tests run on me to see what was going on, and while I tried to get used to the idea that, at just 30, my heart had failed. It didn’t look all that positive. Gently, with a compassion that still makes me emotional, the staff at Southend Hospital’s Cardiac Care Unit tried to bring me to an understanding of what this meant: I would be greatly physically impaired, I shouldn’t expect to ever work again, to have a family, to reach old age. I might need a transplant, if I could get a donor organ. I was eventually discharged, and I tried to live as much like before as I could. I went out for the pitifully slow and shaky daily walks I’d been advised to take – half a mile long, or less – which tended to wipe me out to the point of needing to sleep straight after. I looked into what financial safety nets there were for someone who couldn’t work, only to find they were being taken away. I got angry about that. About everything else I was just numb. But all through this time, though I couldn’t yet feel it, my heart – quite against statistical probability – was healing, and six months later the tests that had been done on me (echocardiograms, MRI scans, endless ECGs and blood tests) revealed definite progress. By the autumn, it was clear I’d got a lot better, but still having an arrhythmia, my heart had plateaued. So I was offered the chance to have a CRT pacemaker fitted. This thing sends electrical signals to put my heart back in synch with itself, and this, exactly one year on, has allowed further healing. I go running – slowly, and not far, but I go running. I lift weights – not heavy weights, like before, but I can do dumbbell curls. The last echo scan I had done suggested an ejection fraction of around 50%, which is the lower end of normal, but is normal. When I was discharged from hospital, it had been 15% (my blood pressure had been so low my GP’s equipment couldn’t measure it, and when I stood up, my heart rate was 120 bpm. My resting heart rate is now 60 – again, low, but normal). All this is a lot to take in, and a lot to go through, but the key fact of it is that I’m still here, and I bear remarkably few scars for it, of any sort. I’ve been unbelievably lucky. I owe everything to the skill of my doctors, the care of my nurses, the support of my family and friends and to luck. Luck most of all. I am reminded of that every time I go to a cardiac clinic and sit in the waiting room with people, some younger than me – not even in their twenties – who have been less lucky. And my life now is completely unrecognisable from 18 months ago, entirely unlike what I had been preparing myself for. In the last few months I’ve started a new job in London, moved into a flat in south London on my own (something else that looked unlikely two years ago was that I’d ever again have that kind of independence) and started playing drums in a new project. I’ve also had the good fortune to meet Melanie, the most wonderful person I know, whom I love and am loved by, and whom I gain strength from every day. So a year on, this is how it stands. I’ve never been happier, and am damn near as healthy as I ever was. To bring things back to this blog for a second, the events of the last two years are why I seldom write about music I don’t like here. The world is full of that stuff, and after all of this, I’m really not that negative a person any more. I prefer to celebrate the things I think are great. I hope that at least some of you are enjoying it, at least some of the time! 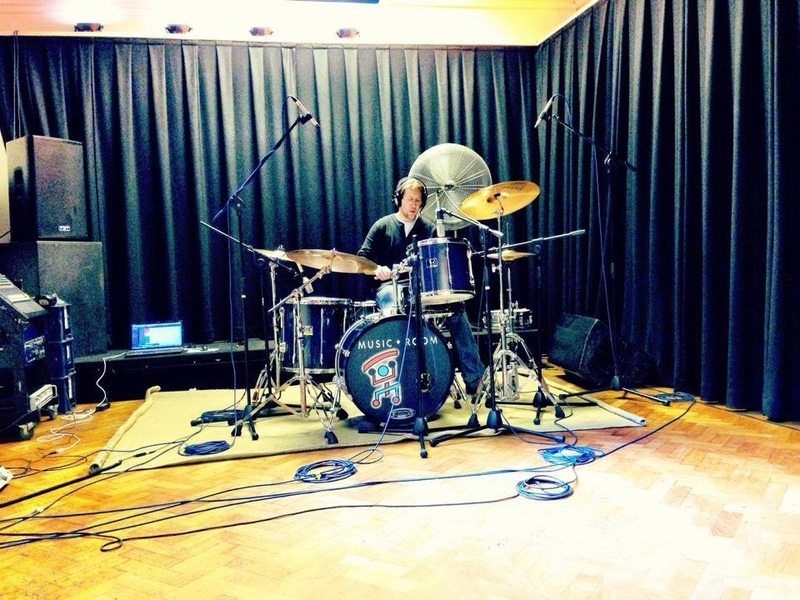 And if proof were needed of my restored physical vigour, this is me at The Music Room yesterday, recording drums for Sumner and giving the drums a bit of a battering! This entry was posted in General and tagged anniversaries, arrhythmia, congestive heart failure, CRT pacemaker, Drums, ejection fraction, HCM, heart failure, post-op, recording drums, Ross Palmer, Songs From So Deep, songsfromsodeep, Sumner, The Music Room on December 6, 2013 by rossjpalmer.